50 x Dark Bluish Gray 1x2 tiles. These are Authentic Lego Parts! 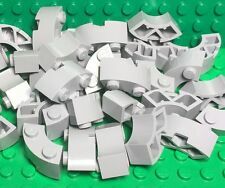 Lego New Bulk Lot Light Bluish Gray Round Corner 2x2 Macaroni brick with Stud Notch X20 pieces / parts,for combine shipping please request a total before payment,thank you. All picked at random. New parts and deals are always being added. Price shown may not be correct. 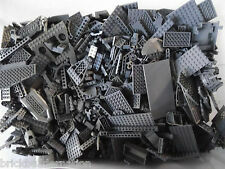 Previously owned Lego tires, wheels, axels lot of 100 . 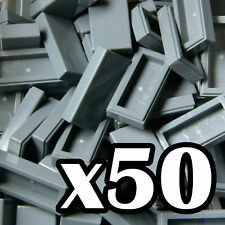 50 x Light Bluish Gray1x1 tiles. These are Authentic Lego Parts! Lego 4 pieces New Dark Bluish Gray Rock Panel 3x8x7 Triangular (part #6083 LURP). Lego X25 new White Turntable 2x2 Complete Assembly With Light Bluish Gray Top Plate bulk parts Lot. As pictured. All sets are in good vintage condition. Message with any questions and thanks for looking. Lego Lot of 8 Light Gray Split Wheels and Black Tread Tires 17x43. Request Total?. All are in good shape with averaging light play wear. Lego X6 new Pearl Dark Gray Pirates Mini Figure / Castle / Kingdoms Shooting Cannon Parts Lot. Lego Bar 1 x 8 with Brick 1 x 2 Curved Top End part 30359 light blue gray 5 pieces picked randomly from the huge lot in the photos . baseplate in photo is for scale and contrast and is not included in the sale. Lego Brick Remover. Everything is 100% genuine Lego. Lego X100 pieces / parts New Light Bluish Gray 1x4 Brick / Standard medium stone gray Building Bricks bulk Lot,for combine shipping if buying anything else please request a total before payment,thank you. Black, white, yellow, or gray rims - Colors may vary. New parts and deals are always being added. You are buying ten Lego Dark Stone Grey Trigger for Mini Shooting Gun bricks. These bricks are fresh from the box/bag and in mint condition. Lego X4 new Creator Building Light Bluish Gray Column Supports part With 2x2 Round Bricks With grille,each one built with 10 pieces of light Bluish gray 2x2 round bricks with grille,so it has 40 pieces build-in to it,To get combined shipping make sure to request a new total before payment,thank you. 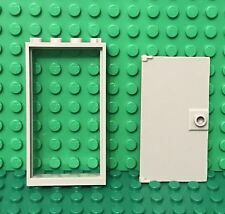 You are buying ten Lego 1x2x2/3 Light Bluish Grey Plate Half Bow Inverted brick. This brick is fresh from the box/bag and in mint condition. The part is like new condition; no cracks or bites. All the detail and line work is crisp and sharp as you would expect. You get images of 2 different "plates" - a "Y" intersection and a divided lane plate. Print as many as you like to extend your layout.